Although people often refer to a slipped disc, the disc doesn't actually move out of place. The term herniation is better as it means that the material at the centre of the disc has squeezed out of its normal space. This problem mainly affects people between 35 and 45 years of age. Between the vertebrae are Intervertebral discs, made of a tough connective tissue or annulus around the outside of a spongy central part called the nucleus. These fibres help the disc withstand tension and pressure, like a shock absorber. Between the vertebrae of each spinal segment at the back are two joints called facets. The alignment of the facet joints of the spine allows movement of the back or neck to bend or rotate. 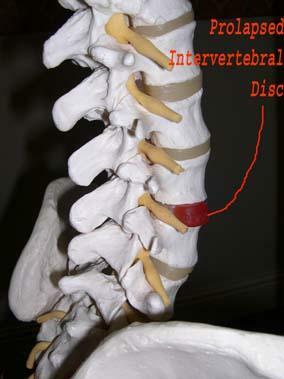 The vertebrae are held together by tough fibrous, rubber band like tissues, called ligaments. Inappropriate bending,sitting, twisting and lifting puts enormous pressure on the disc and can lead to disc prolapse or herniation. In the most severe of circumstances symptoms involve changes in bowel and bladder function. A large disc prolapse that pushes straight back into the spinal canal can put pressure on the nerves that go to the bowels and bladder. The pressure may cause low back pain, pain running down the back of one or both legs, and numbness or tingling between the legs in the saddle area. Rarely the pressure on the nerves can cause a loss of control in the bowels or bladder. This is an Emergency! This may need immediate surgery to untrap the damaged nerves. Although disc herniation can be serious, the vast majority of injuries are not and can easily be helped by your Osteopath. He should normally be able to reduce your symptoms to a pain-free level and give you advice and exercise to help prevent future problems.